Prick Her Finger, Or What? According to the tale, upon the birth of their daughter, a king and queen gave a great feast in which they invited only twelve of the thirteen wise women in the kingdom. The reason given was that they possessed only twelve golden plates for them to eat from, and therefore one guest had to be left out. On the night of the feast, each of the wise women gave the beautiful baby a gift. The twelfth gift was just about to be bestowed, when all of a sudden the door burst open and the uninvited, thirteenth witch (for that is what the wise women really were) came storming into the hall. "This child will prick her finger on a spindle in her fifteenth year and fall down dead! ", she exclaimed before storming out again. Everyone was shocked; wouldn't you be? Luckily, the twelfth wise woman, who had been interrupted before she could bestow her gift, stepped forward and announced that although she could not remove the curse just laid upon the child, she could soften its effects. The gift she gave to the newborn babe was the promise that the child would not die, but only fall into a deep sleep ~ a sleep of one hundred years ~ a sleep from which she could be revived by a prince charming. Just to be safe, the king decreed that all the spindles in the kingdom were to be burned. The child grew into a beautiful princess and her fifteenth birthday came and went without incident. Everyone sighed a sigh of relief that possibly the curse would not be fulfilled after all. But despite all the precautions they had taken to protect their daughter, the king and queen were appalled to find, upon returning from an outing one day, that their daughter was lying prostrate on a bed in an old tower of the castle. Apparently, the young princess had wandered through the various rooms of the castle, and finding the door of the tower room unlocked, had ventured in. There she found an old woman rocking back and forth in a chair, and spinning flax on a spindle. The girl was fascinated since she had never before seen anyone spinning thusly ~ remember, the king had years before decreed that all the spindles in the kingdom be destroyed. The princess, being enraptured by the rhythmic motions in which the old woman was engaged, asked if she could, herself, try to spin the flax. The old woman agreed to show the princess how, and as she reached out to take the spindle, the finger of the princess was pricked. According to the tale, published in The Complete Grimm's Fairy Tales by Pantheon Books, under the alternative title: Little Briar Rose, the exact wording is: ...and there in a little room sat an old woman with a spindle, busily spinning her flax. "Good day, old mother," said the King's daughter; "what are you doing there?" "I and spinning," said the old woman, and nodded her head. "What sort of thing is that, that rattles round so merrily?" said the girl, and she took the spindle and wanted to spin too. But scarcely had she touched the spindle when the magic decree was fulfilled, and she pricked her finger with it. I have always loved the tales spun by Jacob and Wilhelm ~ the Brothers Grimm. In fact,on my bookshelf I have three volumes of their tales; and in two of the volumes, the tale of the sleeping beauty is illustrated with images of a shriveled old crony hunched over a flax spinning wheel, with the young princess approaching. I'm sure that all the readers of this post understand why the image I just described is so wrong, and why it bothers me. It bothers me that the engravers of the illustrations felt they could take the license to interpret the spindle with which the old woman was spinning, as a flax spinning wheel. 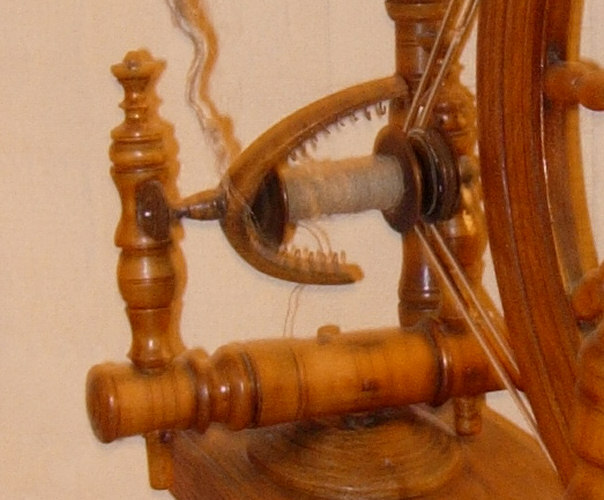 I own a number of spinning wheels, both flax and wool, and can positively state that it would have been difficult for the young princess to have pricked her finger on the spindle of the flax wheel (shown above), because no sharp point extends from the spindle assembly. 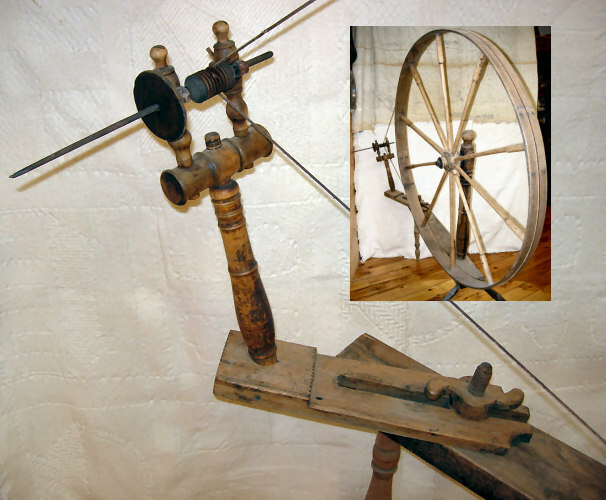 Granted, the spindle assembly of the flax wheel contains two rows of bent wire hooks to guide the fibers as they're wound onto the spindle shaft, but the Brothers Grimm did not state that the princess got her finger pricked on one of the spindle assembly guide hooks. 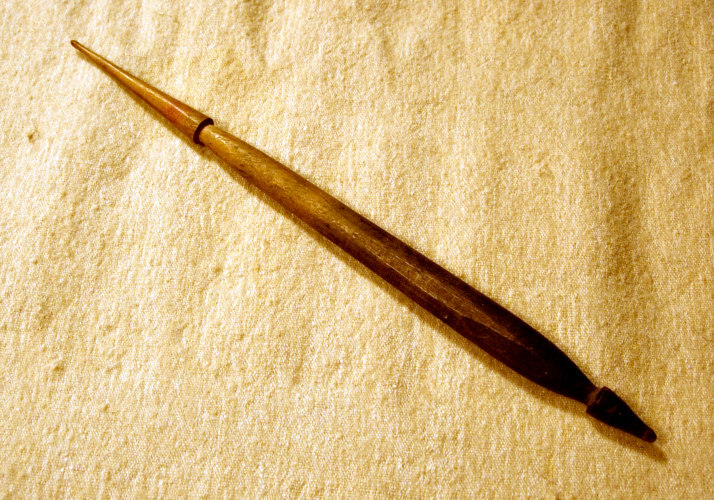 Now the spindle of the wool wheel (shown below), which is variously called a great wheel, is indeed pointy and sharp. A princess could certainly prick her finger on the spindle of the wool wheel, but the Brothers Grimm did not say that the old woman was spinning wool, it specifically stated that she was "spinning her flax." No, the tale, as written by the Brothers Grimm, describes the old woman as spinning flax on a spindle ~ simply a spindle. So it must be assumed that the tool upon which the old woman was spinning ~ and upon which the princess pricked her finger ~ would have been what's known as a handspinning drop spindle. The accompanying photo shows one of these spindles. It is made of wood ~ which would corroborate the part of the tale that stated that the king decreed that all spindles in the kingdom be burned. Wooden drop spindles could indeed be burned. The action of spinning flax on this kind of drop spindle involves attaching some flax fibers to the slender spindle, giving it a twist to make it spin around, and then suspending it so that it's weight tightens the loose fibers into a tight spun yarn. And that action would indeed corroborate the part of the tale in which the princess asked: "What sort of thing is that, that rattles round so merrily?" I think that it can be stated, unequivocally, that the thing upon which the young princess pricked her finger would have been a wooden drop spindle like the one I have illustrated. There is one problem, though. It seems that it would be difficult to prick your finger on one of these spindles, unless one end would be sharpened to a sharp point with a knife. The witch who wanted to bring her curse to fruition could have sharpened one of the ends of her spindle into a very sharp point, but then that sharp end would have probably caught on the forming thread ~ making it impossible for it to rattle "round so merrily." But the Brothers Grimm did not include such an important point in their tale. Perhaps we'll never know what exactly the princess pricked her finger on, but we can be certain that it wasn't the flax spinning wheel that commonly appears in illustrations of the tale.